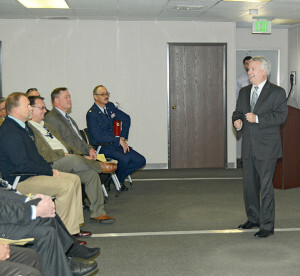 John Esch addresses an audience filled with U.S. Air Force Plant 42 employees during a ceremony. Plant 42 has been around for a long time. At its birth the plant was owned and operated by the U.S. Army, it was used by the Army and the U.S. Army Air Force during World War II. The facility became United States Air Force Plant 42 in the early 1950s and has been serving the Air Force and its contractors ever since. The facility has gone through many changes throughout the years but its undertaking remains the same, “We’re here to provide operational support to our mission partners,” explains John Esch, director of Operating Location for AF Plant 42. The plant is a government facility owned and primarily funded by Wright-Patterson Air Force Base, Ohio, “ … but its processes and people belong to the 412th Test Wing,” Esch makes clear. The now all civilian-run facility provides operating support of the plant grounds and its airfield for its mission partners Boeing, Lockheed Martin, Northrop Grumman and the National Aeronautics and Space Administration. “We lend our support to help them with their mission and their goals,” Esch offered. He said the business end, like leases and payment matters are handled by Wright-Patterson. If additional companies wanted to move their operations to the Plant, they would have to go through Wright-Patterson AFB in Ohio. Supporting its mission partners is no easy task. Esch explains that AF Plant 42 is made up of 6,600 square acres and says that takes a lot of communication. “We work as a team here with our mission partners and with local municipalities including the Los Angeles County Fire Department, the Highway Patrol and the Sheriff’s Department. We have formal and informal communication to help provide the support needed for our partners’ success,” he said. While talking about mission accomplishments Esch explained the plant’s operations were run by contractors for nearly 60 years. He said by 2010 it went from a contractor to a government position. “This last year AF Plant 42 has transitioned to a government agency, which is much different than a contract operation,” he said. Esch said his goal for 2017 is to position the plant in a way that it has a lot of agility to respond to whatever their mission partners need and to do that efficiently and in a cost effective way. “This is a yearly $4 billion-plus enterprise out here,” Esch said. He said Plant 42 is just shy of a billion dollars a year in local impact. Esch considers AF Plant 42 as a unique operation because, he says, there are only four industrial complexes left that are owned by the Air Force. “There used to be hundreds, this particular one is the only one that hosts three different defense contractors and has its own airfield,” he proudly states. Esch says he wants everyone in the Antelope Valley to be proud of what goes on here, because, he says, the people of the AV are all a part of it one way or another. “This is the best job I ever had,” said the man with a diverse background a mile long. 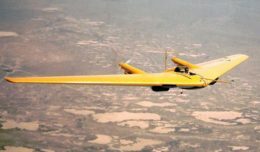 “You get to see aviation history, it’s a neat, cool profession to be in, he says and urges today’s young folks to pursue a higher education and check out career opportunities available to them at Plant 42. Like other military facilities, AF Plant 42 has been associated with a set of its own rumors, and although Esch admits he has been questioned on occasion about aliens and if they are working reversed engineering at the local government Plant, the director of Operating Location for AF Plant 42 remains noncommittal. “I can’t confirm or deny the existence of extraterrestrial beings,” he said.